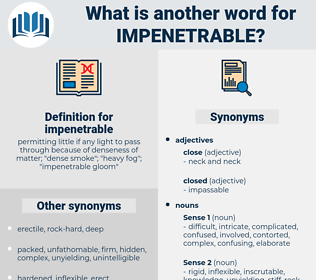 What is another word for impenetrable? 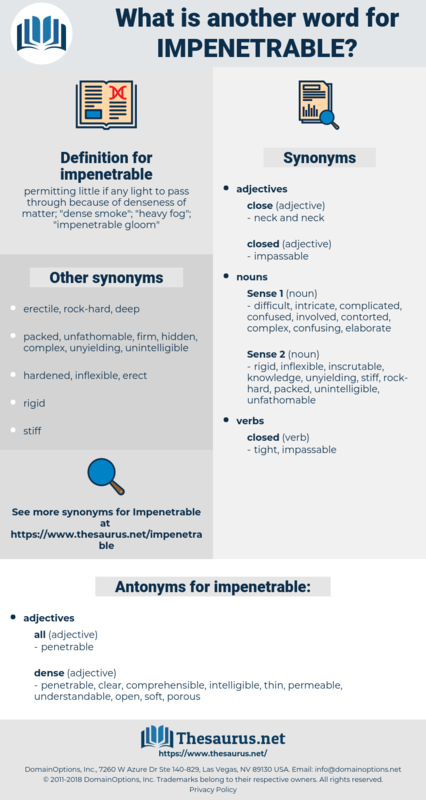 permitting little if any light to pass through because of denseness of matter; " dense smoke"; " heavy fog"; " impenetrable gloom"
inscrutable, unintelligible, unfathomable, opaque, impassable, inaudible, mysterious, insurmountable, non-transparent. porous, thin, comprehensible, intelligible, understandable, permeable, clear, open, soft. known, explainable, obvious, plain, explicable. fundamental, fathomable, unambiguous, organized, easy, elemental, bendable, essential, giving, squishy, systematized, comprehendible, unsealed, convincing, connected, absorbent, open-and-shut, rudimentary, underlying, perspicuous, unequivocal, flexible, malleable, systematic, lucid, cogent, basic, coherent, straightforward, elementary, manifest, transparent, ordered, pellucid, leaky, elastic, simple, orderly, unmistakable, negotiable, yielding, pliable, compelling, apparent. Otherwise the mystery is impenetrable. The fog was thick, yes, but not impenetrable.